Home » Legal » Random » American Apparel CEO Plans to Fire Unattractive Employees? Hmm, this could get very interesting. 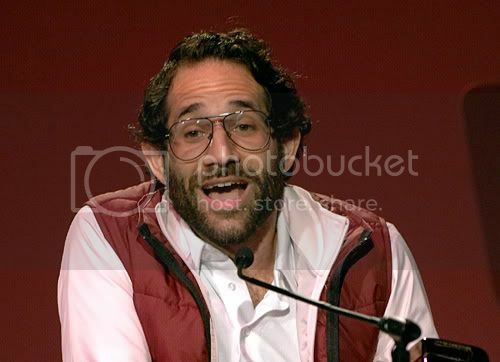 According to an e-mail Gawker received from American Apparel store manager, AA's CEO Dov Charney (yes, that's him in the photo above) is instructing all stores to email him staff photos so he can personally critique their looks. He plans to fire the ones he deems "ugly". Summer is supposed to be a great sales season for AA. Needless to say, with the state of the economy, sales haven't been going so well. Dov usually gets on the conference calls and talks to people, but one week, he went on a huge tirade and made stores that weren't doing well send in group photos. Why, you ask? He made store managers across the country take group photos of their employees so that he could personally judge people based on looks. He is tightening the AA 'aesthetic,' and anyone that he deems not good-looking enough to work there, is encouraged to be fired. This is blatant discrimination based on looks. Dov personally judged each person in group photos that were sent in, and if you weren't to his liking, then boy... watch out. The comments that he made were raging from childish ones to insulting ones. Managers that don't comply with these new standards are afraid of losing their jobs. Employees who aren't up to Dov's "look" and whose work ethic is "just ok" are being targeted and scrutinized and the minute they make small mistakes, they are being fired. But it's only because Dov wants to weed out the "ugly people." It's ironic that he would rather have gorgeous slackers who don't move the product [or lift a finger] working there than normal looking people who are really aren't that bad looking, but are A+ sellers and great at customer service. The real irony here is that he is no [looker], himself. He's asking for a class-action lawsuit and i hope that when it rains, it rains hard. Worst place to work, ever. This is happening at many stores across the country. Yup, we smell a class action lawsuit brewing.